I have finished reading Gut: The Inside Story of our Body’s Most Under-rated Organ by Giulia Enders. It has challenged my identity. The microbes in me out-number my human cells ten times and I have about 100 trillion microbes in my gut! So am I a person, or a colony? Perhaps I should refer to myself (us) as “we”. Given that I am out-numbered, how do these microbes influence my behaviour and my health? Rodents infected with the toxoplasmata protozoa lose their fears of cats. This is not a good for survival and Giulia Andrea reports that behaviour of humans infected with toxoplasmata changes too (we get the infection from cats). For example, the risk of being involved in a car accident is increased in infected people, especially in the early active stages of infection. My gut bacteria influence my mental and physical well-being and influence what I choose to eat. A recent Scientific American article confirms this. Gut microbes have also been shown to influence diet and behavior as well as anxiety, depression, hypertension and a variety of other conditions. Our relationship with our gut biome has evolved over millennia. These are common to all people, with some regional variations. For example, the micro biome of Japanese have borrowed a gene from marine microorganisms to help breakdown seaweed. Giulia Enders suggests that if we had long enough, our micro biome would adapt to the highly processed foods of the Western diet. Allergies and food intolerances may be caused by our digestive system’s inability to process the foods we are eating. Michael Pollan states the solution succinctly “Eat food. Not too much. Mostly plants”. To help us rehabilitate our digestion and repopulate the gut with a health-enhancing micro biome we have two options, probiotics and pre-biotics. Most of us are familiar with these – typically fermented foods containing billions of beneficial bacteria. Common examples are yoghurt, kefir, sauerkraut, kimchi and kombucha. Probiotic supplements are also available. These are great, but need to be frequently consumed to maintain the benefits. These are foods that include residues that make the journey through to the lower gut to sustain beneficial micro-organisms. Dr Frank Jackson tapes about the benefits of probiotics in this video. His website has a list of the top 11 prebiotic foods. They are listed here with their percentage of fibre (by weight). This brings us back to local food – food you can grow in your garden. My digestive system is approximately 7 metres long. Sometimes I am more interested in pandering to the first 100 mm or so – the bit where I can taste the food, rather than the other 6.9 metres. Giulia Anders book teaches us to take more notice of the other end of our digestive system. Perhaps we need to talk more about our digestive systems. You won’t have to go too deep in your Facebook feed to find someone talking about food – maybe we should be less embarrassed about talking about digestive system output- but no selfies please :-). 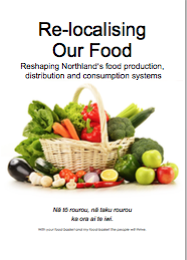 Our focus at Local Food Northland is about the shift from industrial food systems to sustainable food systems. For us to better understand our current food system reality, we look back to look forward. This is the first of three posts to explore the tides of history that have shaped our food system. We are what we eat and what we are becoming is an increasingly overweight and unhealthy population. There are three major drivers of dietary change in Aotearoa, the impacts of colonisation, industrialisation and consumerism. Before the arrival of Europeans, Māori were isolated in Aotearoa and there was therefore no imported food. Neither was food processed beyond cooking, drying or fermenting. This image from Te Ara is an artist’s impression of a 1700s garden in the Auckland region (drawing by Nancy Tichborne). Gardens were community enterprises with crops grown including taro, hue (gourds) and kumara. Helen Leach’s book 1,000 Years of Gardening in New Zealand documents pre-colonial gardening. It includes a drawing by one of Captain Cook’s crew of an East Coast garden with kumara, yam, taro and gourd. According to Te Ara (The Encyclopaedia of New Zealand) Māori had a life expectancy of about 30. This is low, but better than that of Britain at the time. But “by 1891 the estimated life expectancy of Māori men was 25 and that of women was just 23 (Te Ara). We cannot attribute this to diet, as disease, alienation from land, war, and war’s inevitable consequence, poverty, saw population decline and life expectancy reduce. Māori adapted quickly to the new foods bought by Europeans, soon producing large quantities of food including potatoes, fruit and meat. By the mid 1800s, Māori were producing flour in their own mills from their own wheat. Imported foods began to supplement local diets and the appetite for sugar was such that the Chelsea Sugar Refinery was established in 1883. Sugar is increasingly associated with the incidence of non-communicable disease (NCDs). In a food environment where Māori were struggling with the aftermath of war, European diseases, land alienation and the impact of tobacco and alcohol, sugar became another health burden. The world view of the colonialists was shaped in part by social Darwinism and assumption of the innate superiority of Europeans, especially English. In this context, Dr Isaac Featherson said it was the duty of Europeans to “smooth down … [the] dying pillow’ of the Māori race.” Thus the food landscape for Māori in the second half of the nineteenth century was not conducive to health. The communal approach to gardening was probably one factor that enabled Māori to sustain and recover the population. This graph (from Te Ara) shows Māori population from 1841 to 2006.The decline post-Treaty took almost a century to recover. Arguably, the homogenising of assumptions of colonisation continued largely uncontested and dissenting voices unheard through the middle decades of the twentieth century. The Māori renaissance of the late twentieth century laid the foundation for reshaping the food environment, but the forces of industrialisation and consumerism invoked another form of colonisation that dominated the food landscape as we shall see in the next two posts on this topic.